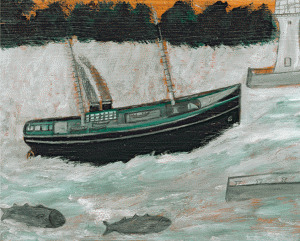 Alfred Wallis was an english painter and fisherman. He moved to St Ives in 1890 where he set up as a marine scrap merchant until 1912 when he retired. Wallis only began painting after the death of his wife in 1922. Wallis was discovered in St Ives by artists Ben Nicholson and Christopher Wood in 1928 which encouraged them to continue their primitive feel of painting that Wallis became famous for. The main subjects for Alfred Wallis’ paintings were ships at sea and shipwrecks, using very few colours, mainly dark browns, shiny blacks, greys and whites. Wallis died in 1942 in Madron Workhouse.